UPDD driver suite for Windows, MacOS, Linux, Android, Solaris and Win CE. Our drivers can be used to add touch support where none exist or for enhanced functionality not offered by the native driver support or to support touch hardware not supported in certain operating system releases. UPDD supports multi-touch at an operating system level (if supported) but also at a native UPDD API and TUIO Server level allowing for the development and support of multi-touch and multi-user UPDD API and TUIO client applications. UPDD V6 driver is available for Windows XP though to the latest Win 10 patch release. In all cases it supports legacy serial and non-HID USB devices as well as modern HID USB devices. It allows for modern multi-touch monitors to be used in old XP systems as well as old legacy touch hardware to be used in most recent Windows systems. It also brings a wealth of touch functionality and hardware configuration options not supported by native HID drivers. UPDD V5 is still available for Windows 95, NT and 2000. UPDD V6 driver is available for MacOS 10.8 and above. It supports legacy serial and non-HID USB devices as well as modern HID USB devices. 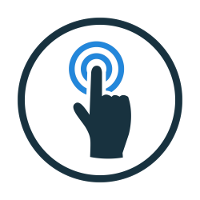 When using a multi-touch touch screen it supports full multi-touch gestures, mimicking the functionality of a multi-touch trackpad or magic mouse. UPDD V5 is still available for Mac OS X 10.6 and 10.7. The implementation of UPDD V6 driver within the Linux environment is such that it should work in most mainstream distributions and simplifies the use of touch in what can sometime be a difficult environment to configure and utilise touch functionality. It supports legacy serial and non-HID USB devices as well as modern HID USB devices. In this predominantly mobile operating system UPDD V6 extends touch support to any UPDD supported USB HID device. Not all previously supported operating systems are currently supported by UPDD V6 as support has been added piecemeal. However, UPDD V5 is still available for Win CE 5 through 2013 and Solaris 10. If demand justifies it we will add support in V6 for these OS's. Please contact us for further details.